When I started searching through Fliegende Blatter, my goal was to find the story that accompanied my own Wahle painting. I’ve also naturally found other Wahle’s each with their own stories. It is very clear that for these illustrations, their context matters. Above is “Der Galante Offizier (The Gallant Officer)” which was sold at auction in Munich in 2003. A gentleman sits adjusting his lapel flower while a woman looks away. It’s a lot clearer in the print version below. It’s a pity the painting image isn’t clear because I like the use of colors in the purple flowers, red uniform collar and green tone in the woman’s gown. I found this image printed in a January 1903 issue of Fliegende Blatter filling up most of a page as is typical for Wahle pieces. (The engraver appears to be H. S. Humprecht.) Given the unpainted section along the top of the painting, it makes sense to see the image so closely cropped in print. From the printed version you can see that the furniture, flowers, woman’s dress and man’s uniform are finely detailed. The monocled gentleman looks incredibly excited and is smiling broadly. I can’t decide if the woman behind her fan looks away coyly because of this exuberant attention or is looking away in frustration because she is forced to tolerate this man. I’m a little confused why her left arm is just hanging there and not reacting to the situation. 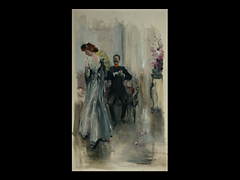 Perhaps this was done to maintain the composition of the piece, with the man dead center and the woman balanced by empty space and the floral arrangement. While I can’t begrudge a title given at auction, I don’t see why this was named, “The Gallant Officer”. Thankfully, I’m getting better at reading the horrible Gothic font in Fliegende Blatter. Above the image it says, “Ein Schwerenöther”, which translates today (as “schwerenöter”) to “ladies man or philanderer”. Very interesting! 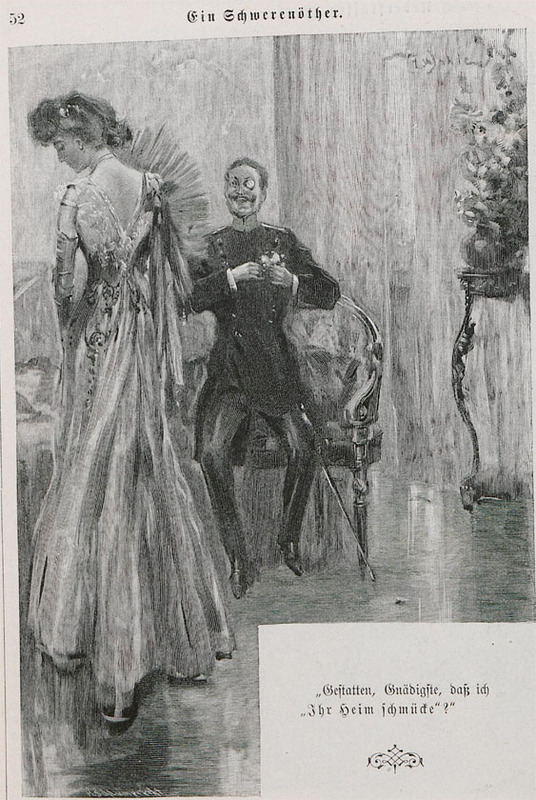 Also, the cut out text in the image reads, “Gestatten, Gnädigste, daß ich ihr heim schmücke?” which Google translates to, “Allow, madam, that I adorn your home?” I don’t understand German, let alone 1900’s amorous advances, but something is definitely going on in this picture. Given the difficulty of interpreting the woman’s pose, I still can’t determine how she is reacting to the man’s potential come on. At the very least, I will probably refer to this image as “The Flirtatious Officer” from now on given the textual clues in Fliegende Blatter.